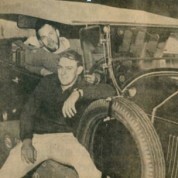 In 1967 two young men decided to explore the world, traveling in a 1925 vintage Buick. One of the intrepid duo was Hugh Blomfield of Russell, then aged 22. Their intention was to explore Australia, Asia, the Middle East, Europe and Britain. Sadly, it was not to be; whilst the Buick survived the rigours of the Australian desert, the tires did not, blowing out in the extreme heat. Replacement vintage tires were few and far between and by the time they reached Mt Isa, the dream was over. Hugh found a job digging ditches at the mine, toiled till the morning break, walked off looking for a cup of tea and kept walking to the nearest Travel Agency where he booked a passage to England. Hugh eventually settled back in Russell with his wife Roz and spent many years as a skipper with Fullers before setting up his own business. Exploring has always been in both Hugh and Roz’s blood and their travels have taken them to Uzbekistan, Borneo, Peru, Chile and the Galapagos Islands to name just a few of the more exotic destinations. This year Vietnam and Thailand are the countries of choice and though modern jets are far more convenient than an ancient Buick, they do lack a sense of grand adventure and romance.